Limited double 180gm vinyl in gatefold sleeve with download code and 12" x 12" 8 page lyric booklet. After more hype and fanfare than I can remember, Daft Punk finally deliver "Random Access Memories". On the previous trilogy of records they've changed the music world and heralded new eras and scenes. From the jacking filter house of 1997's "Homework", an album which set the blueprint for the whole French touch scene, to the pop majesty of 2001's "Discovery", a sampledelic journey through the kaleidescope of 70s disco and funk, to 2005's "Human After All", the rough and abrasive record that in hindsight heralded the new wave of French electronic producers. They are rightly regarded as the leading electronic musicians of their time and not only have they recorded a hype worthy record, they've delivered a classic. 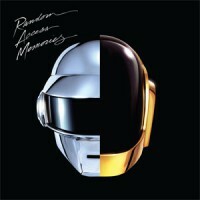 Drawing inspiration of the sounds of the 70s and 80s, "Random Access Memories" serves up bouncing disco (Worldwide summer smash "Get Lucky" and "Lose Yourself To Dance"), prog jazz ("Giorgio by Moroder" and "Touch") and West Coast AOR ("Instant Crush", "Beyond" and "Fragments of Time"). The influences are similar to 2001's "Discovery", but rather than samples, the album instead features an all star roster of collaborators from all over the musical world recorded live in studio sessions. Those expecting an album of easy dancefloor hits will be disappointed, Daft Punk have never simply retrodden uninspired paths and have instead turned out an expansive and exhaustive journey through an era before house music, where sentiment and nostalgia is preferred over beats. But don't fear, the dancefloor won't be neglected entirely, album closer "Contact" is probably a hint of what they might have in store for us on the soon-come remix disc! Patrick says: The massive and eagerly awaited new album from Daft Punk, does not disappoint. This is their fourth album and first in over eight years. Working on a theme of 70s disco, influenced by movie soundtracks, the album is full of catchy summer sounding hits.